Inspired Table Timeless, modern, artistic. These are the table linens that create the ambience you desire at your next dinner party. Diamant Spellbinding woven rosettes of cut gems and pendants combined with the light of a candle or lamp majestically play across the linen fabric. Combining design, thread, weave, color, and lighting, a jacquard woven cloth is exquisite at any occassion. What's a Holiday without a well-dressed table? Holiday gatherings with family, friends, and neighbors is a glorious time. When the dining table is set for the occasion it is even more so. We believe a table dressed with fine linens and candles, which extend into the kitchen and the guest bath, create the ideal ambiance. Fine European linens for formal and informal dining. 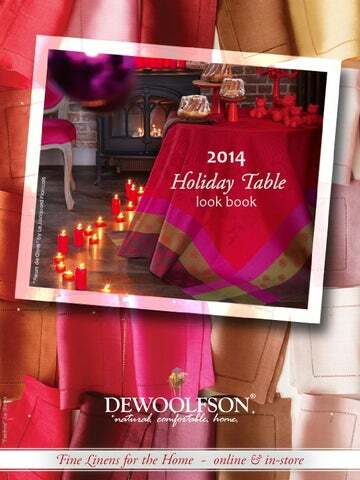 This 2014 limited edition Holiday table collection was woven with a subtle design to transcend its celebratory nature. This 2014 limited edition Le Jacquard Francais holiday table collection is subtle in its design so you can throw a festive dinner party any time of the year. For holiday last-minute & holiday dreams Our Gift Certificate – the perfect gift for that oh-so-dear, yet hard-tobuy-for person in your life. You decide the amount and we will email them the wonderful news inside our lovely card. Simple and sincere. natural. comfortable. home. DEWOOLFSON LI N ENS 9 452 NC H ig hway 105 S Ba n ner El k, NC 28604 U.S.A.
© 2 014 DE WO OL F S ON D OW N I N T’L ., I NC.